Oakland has been buzzing about the hiring of a new head basketball coach — our lord and savior Jeff Capel. But while the Pitt community has been busy celebrating the arrival of a new king, the rest of the sports world has continued to make headlines. The Pitt News staff is back to round up some of the best stories of the week. Click here to read last week’s takes. Among all the hype surrounding the opening of major league baseball this week, one thing in particular has been making the rounds in the media — the cheesiest, spiciest and wackiest foods debuting at ballparks across the nation. CBS Sports made a list outlining all of the new, crazy fare that fans can expect to consume this season, and there are a few standouts. Topping our list, The Dilly Dog — a hot dog inside a hollow pickle, battered and fried, drizzled in yellow mustard. Three of our favorite things — hot dogs, pickles and self-loathing — wrapped into one delightful treat. Are we surprised it’s served in Texas? No. Another item worth note is the Spec-tater, a jalapeno-cheddar sausage stuffed in a potato and wrapped in bacon, topped with cream, cheese and more peppers. It’s a lot like a turducken, but worse — if that’s possible. They say baseball is America’s pastime, but obesity comes in close second. Baseball season is finally upon us, which means that the next seven months will be rife with home runs, stolen bases, web gems and dominant pitching. Speaking of home runs, it will be interesting to see how Major League Baseball responds to accusations of altering the makeup of its baseballs to favor hitters, otherwise known as juicing balls. Players hit a record 6,104 home runs last year — nearly 400 more than the record 5,693 at the height of the steroid era in 2000. There were rumblings that something similar was happening when a total of 5,610 balls went over the wall in 2016. Steroid abuse clearly drove the record up in the early 2000s, but this time the reason is still unknown. Commissioner Rob Manfred has repeatedly denied rumors that the league was juicing the balls to get the home run rate up, but FiveThirtyEight recently published a report proving that balls have been “subtly but consistently different” since 2015. I personally have no issue with more homers, but if the MLB is changing the balls intentionally, it needs to fess up. Not just for the integrity of the game, but for the good of the league. LeBron James surprised and outraged members of the NBA community when he told The Associated Press Tuesday that he would vote for himself for league MVP. 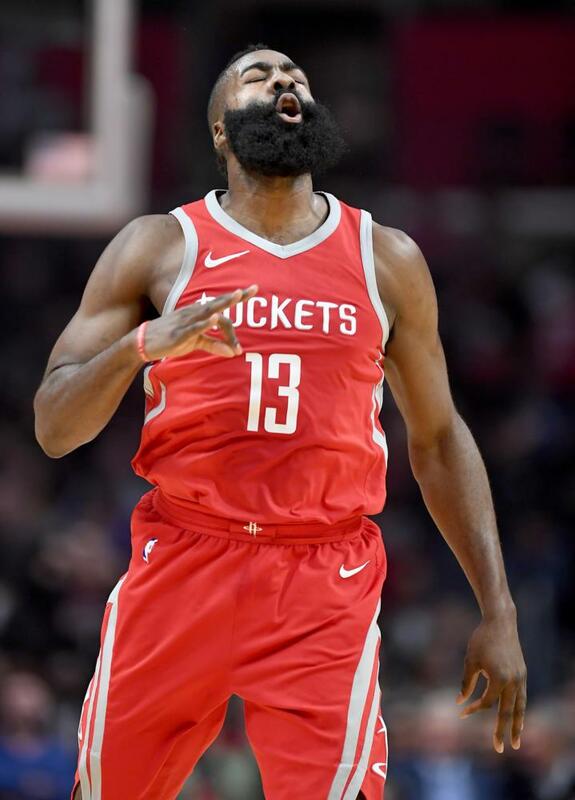 The prevailing opinion among fans and analysts has been that this year’s MVP award already belongs to Houston guard James Harden. Harden averages 30.7 points, 8.7 assists and 5.4 rebounds per game, while James averages 27.6 points, 9.1 assists and 8.6 rebounds. Statistically, the cases are pretty close. And Harden has gotten a lot of credit for leading his team to first place in the West, while James’ Cavaliers are sitting in third place in the East. But James can’t be blamed for the Cavaliers’ struggles this season. Cleveland has been ravaged by injuries and trades, making it hard for the team to establish a flow. Harden plays in a high scoring system with one of the best point guards in the league, Chris Paul. James has been spectacular in what has been perhaps the most tumultuous season of his career. Maybe we shouldn’t be so sure that this award is decided already. The Houston Rockets and Golden State Warriors are the two top seeds in the NBA’s Western Conference and currently have the first- and second-best odds to win the NBA title. With the positions both teams are in, they deserve to be the favorites out of the West, but there is a dark horse that could spoil both their seasons — the Oklahoma City Thunder. The Thunder is a combined 3-2 against the Warriors and Rockets. They’re one of the few teams in the NBA with a combined winning record against both squads. They are led by last year’s MVP Russell Westbrook, who is nearly averaging a triple-double at 25.4 points, 9.7 rebounds and 10.2 assists per game. In response, teams charged Westbrook defensively last year, seeing a weak Westbrook as the only offensive option. But this year, league defenses won’t have that same luxury. The Thunder added All-NBA talents Paul George and Carmelo Anthony in the offseason to help Westbrook on offense. Center Steven Adams has evolved into a defensive stalwart, who is also averaging career highs in nearly every offensive category. The Thunder was built to beat the Warriors and has proven it handles the Rockets as well. If there is one team that can upset the status quo in the Western Conference, it’s the Thunder. The Washington Nationals boast arguably the best starting rotation as the 2018 season gets underway. Leading the way is two-time National League Cy Young winner Max Scherzer, who begins his 11th season in the MLB with an overall ERA of 3.30. In his three years with Washington, he has never had an ERA over 3.00. Fellow 2017 NL Cy Young nominee Stephen Strasburg — who owns a 3.07 ERA more than eight years in the majors — adds another All-Star arm to the rotation. He earned an impressive 15 wins and four losses in both 2016 and 2017. The top three of the rotation is rounded out by lefty Gio Gonzalez. He pitched his way to a sub-3 ERA and earned a spot on the Cy Young ballot at the end of last year. With three arms of that caliber, partnered with MVP-level play from right fielder Bryce Harper, Washington could finally break through and represent the NL in the World Series for the first time in franchise history. Barring any injuries, the Nationals rotation should be the best in the league, and everybody else should consider themselves warned.